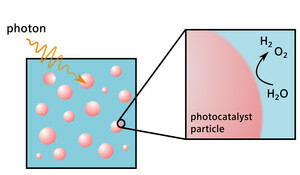 Photocatalysis relies on the energy of light photons – instead of thermal energy – to drive and accelerate chemical reactions. Photocatalysis is a broad research field with a number of applications, some of which have already made their way to commercial products as, for example, in water and air purification technologies as well as in self-cleaning and anti-bacterial surfaces. Despite these advances, implementation of reductive photocatalysis – and especially processes related to solar fuel generation such as in photocatalytic water splitting and carbon dioxide photoreduction – is still inhibited by low efficiency, stability or poor selectivity of contemporary catalysts. The field of heterogeneous photocatalysis relies on solid-state (nano)materials to access these red/ox processes. 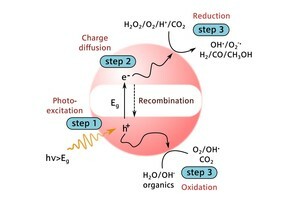 Here, since the discoveries of Fonda and Fujishima, targeted research attempts have been addressing each of the three main photocatalytic steps: light absorption, charge transport and redox catalysis (see scheme) - yielding fairly robust photocatalytic systems. In fact, most commonly used oxide-based photocatalysts are exceptionally stable under reaction conditions, exhibit low toxicity and can be easily nanostructured using inexpensive fabrication and processing techniques. However, reliance on standard heterogeneous solid-state photocatalysts (TiO2, WO3, Ta2O5, CdS, C3N4 etc.) limits us to poorly defined, rigid and thus unspecific inorganic surfaces that can barely accomplish complex multi-electron redox processes (step 3). This is especially relevant to water oxidation and CO2-to-fuel conversion reactions that pose additional requirements to reactant and product selectivity. To address the catalytic challenge of heterogeneous photocatalysis and get access to high value products (H2 and hydrocarbons), we take the inspiration from nature and the field of artificial photosynthesis to combine stability and robustness of solid-state oxide photocatalysts with high selectivity and flexibility of molecular-sized artificial homogeneous catalysts.